Created stage ready for professional artists. Suitable for a medium metal mouthpiece, the Silverstein CRYO4 A-Frame Ligature is a tool to discover a fuller and rounder sound from your instrument. Professionals will cherish the way that this ligature allows stronger projection and better control on focus. 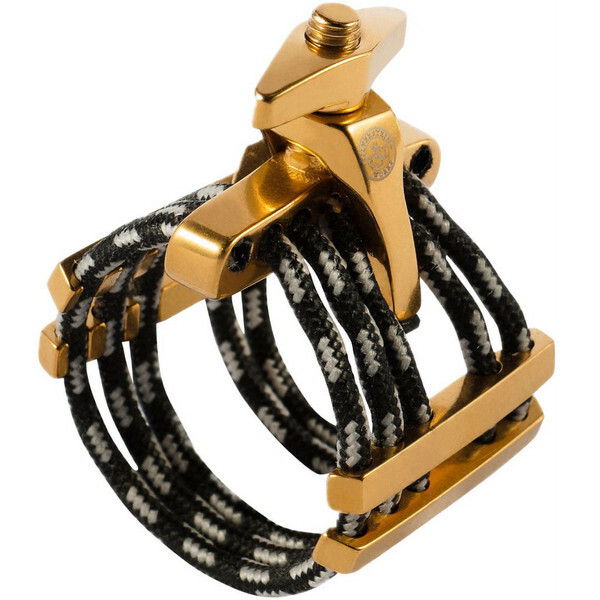 Equipped with an omnicap and anti-slip pads, this ligature is the evident choice for the perfectionist musician. The sound adjustment screw main screw can convert turning torque to pushing force due to a particular mechanism. This means that by tightening less the sound gets darker and the reed vibrates more. The Silverstein CRYO4 A-Frame Ligature is capable of emulating different reed styles for even more customisability. Tightening the cords puts more pressure onto the reed which makes it sound fuller and darker, whereas loosening the cords relieves pressure for better projection and a more direct tone. This ligature features a thinner thread for even less contact and pressure with the reed while maintaining the ligature's trademark design and grip. This makes all the difference for greater control, a more dynamic sound, and a richer tone. The CRYO4 Ligatures use an advanced metal alloy. This is where a nano-scale polymer layer is formed by the unique coating technology over the whole surface of the ligature. This improves durability and sound quality across a wider range of mouthpieces, and is aesthetically pleasing thanks to the mirror finish. This Silverstein ligature comes equipped with an OmniCap that is small enough to fit in a compact case. The OmniCap is designed to secure and protect the delicate mouthpiece, tip, and reed while not in use. Not only does the OmniCap protect the ligature from physical damage, but it also preserves the reed's moisture, so you're always ready to play. Silverstein Works create products with the professional musician in mind. Their goal is not to make simple products but to help create that experience, unrestrained by anything other than the musician's own desire and drive for perfection. The creators and contributors of Silverstein Works' products understand what it takes in order to shape instruments and accessories that are able to enhance ones full potential. Silverstein Works and the products were born not only out of the need to be perfect, but to enjoy and relish the pursuit of perfection.